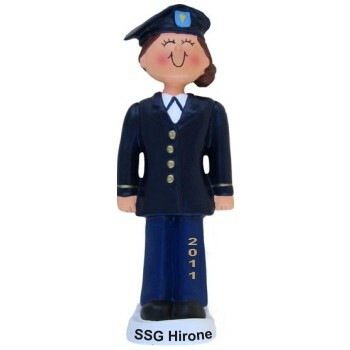 Let her know you're proud of her service with the army female brunette personalized Christmas ornament with a big smile and attractive dress blues. We hand letter a name, rank and year onto these military ornaments personalized to be special keepsakes, and they ship in our custom velvet pouch. The female brunette personalized army ornament makes a wonderful holiday gift or can be given to celebrate a promotion or return from deployment.